It's BOO!! !It's Boo and his buddy, Buddy!Other people slap a few pics or gifs up and call it a review, but I...I just can't do it! However, doing so would be fitting for this picture on Boo, who has become one of the world's most well known dog's. And okay, he's pretty cute too.Normally I would one-star the F out of something like this, but it would be evil not to give 5 stars to a book about a cute dog doing cute things, even if there isn't much depth to it beyond that. The reason I'm okay with slapping on a full five stars is because of all the good Boo's done in the world. No seriously! Since Boo's meteoric rise to fame (over 12 million "likes" on his Facebook page...for a dog! ), his owner has channeled this attention towards some worthy causes. Hey, the kids love Boo, so it's nice to see the visits made to children's hospitals replete with giftbags and the bundle of joy that is Boo! BOO IS IN CHICAGO CUBS UNIFORM! That is all you need to know. Exactly what you'd expect - a tiny puffball of a dog (if you can even call it that), and a book filled with pictures of it. The kids love it though, and apparently this puffball has done a lot of good in the world, so you can't fault it for that. Very cheesy though. A cute, pick me up book. This is definitely the cutest dog in the world! Almost too cute to be real.Read if you like dogs. Fabulous. This is one of those little table books which mostly consists of pictures, but the pictures are pictures of what may be the cutest dog ever (according to the title of the book, and according to me). SO adorable, so fluffy. I would consider buying this as a gift for someone who loves dogs. I even kind of want it for myself! This is the first book about Boo, a small Pomeranian with a teddy bear hair cut that has become an internet sensation on facebook, perhaps even more popular than Maru the cat. Some consider him the cutest dog in the world. If he isn't, he's pretty darn close. The photographer does an great job in capturing pictures of Boo in his every day life. I would have given the book 5 stars, but there are many pictures in which Boo takes a LOT of naps, so there's a lot of repetitiveness. Not the writer or photographer's fault, I'll grant you, if the book is staying true to how Boo spends an average day. The book also didn't give enough information about Boo's background. As an introductory book about Boo for those who don't know about him via the internet, there are so many unanswered questions: Where did he come from? What's was his story as a young pup? Where does he live? Where did the idea for his adorable hair cut come from? Personally, I want to know a little more about baby Boo and want to see pictures! I've read the "I Am Maru" book, and I found it offered a little more in background of the animal. Regardless of my critique, I am a HUGE fan of Boo. I mean, who could not fall in love with such a sweet face? I found this book absolutely charming and amusing; a lot of fun to read. It would make a lovely gift for any Boo fan and younger children. Lengthwise, it is a VERY short read. I finished it and it's sequel (which I liked better) in about five minutes. Good effort for his first book, though. A solid B+. There's really only one thing to say about this book.AWWWWWWWWWWWWWWWWWWWWWWWWWWWWWWWWWWWWWWWWWWWWWWWWWWWWWWWWWWWWW!!!!! !On cold, wet, dark winter evenings, we sometimes need something to cheer us up. And Boo's book is a great place to start. Sure, there's not a lot of substance there. But there's a whole bunch of extremely cute photos. Leaving a copy lying around the house to hear the cries of "AWWWWWW!!! He's SOOOO cute!". This is one of those books that, whether you're an animal lover or not, you're bound to enjoy in one capacity or another. A great pick-me-up book for those dark nights and lonely moments. Thanks, Boo! Keep making the world a better place through your cuteness! 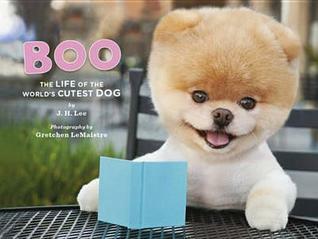 Boo: The Life of the World's Cutest Dog was, well, cute. It takes you into a day in the life of Boo doing some of his favorite things. Boo is adorable, seriously this dog is like a perfect puffball of adorable. He looks like a stuffed animal only cuter! If you're looking for something with depth and meaning, substance and complex characters I don't even know why you're looking at this book - if you want cute pictures of Boo and his buddy, Buddy this is for you. It has cute Boo pictures, and sometimes you need pictures of cute things (especially cute animals) to make your day better or for no reason at all (that is the power of cute pictures). Boo, the adorable Pomeranian dog who has acquired Facebook fame, shares with readers what it's like to spend a day in his life, from sleeping to playing to wearing stylish outfits to hanging out with his best dog friend Buddy to sleeping some more.This is a must-read for any dog-lover. Boo is super cute, and readers will get a chuckle out of all of his pictures--and will probably want to go out and buy a Boo of their own. I saw this book beside the stuffed animal in a store. I haven't read the blog this is based on but I'll give it to Boo. He's pretty darn cute. Maybe not the cutest in the world but definitely adorable. the text doesn't really add anything but the pictures are of (if not the World's Cutest) a very cute dog going through various cute activities. Have an hour's worth of cute-gazing, very useful for those who can't take Cute Overload with them.Library copy. This is a cute book for animal lovers. It is based on the life of Boo. Boo is an adorable puppy dog with a large head and a strange haircut and is an internet sensation. It appears that the book was created after Boo was/is featured on the web. Great layout and adorable photos. Cute dog, but basically just a photo book. I really don't think he is the cutest dog but the book is a fast read and somewhat cute. Nothing out of this world but ZOMG THIS WAS SO CUTE I CAN'T WITH THE PICTURES! Little Boo is adorable. The pictures are what really sells this book. Not the world's cutest dog, in my opinion. Cute, yes. Dog with the funniest haircut, yes. That dog IS pretty cute. And Finn can't get enough. On our way to recheck it out from the library. boo is too cute! i liked this probably more than i should.